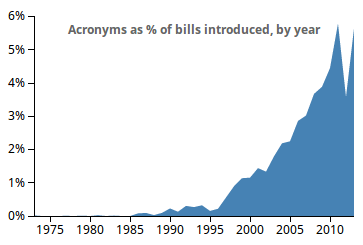 An overly in-depth analysis of congressional acronym usage in bill names. For the complete list, see Legislators. The None of Our Funds in the Interest or for the Exercise or Leisure of Detainees (NO FIELD) Act, which would reduce the DoD budget by whatever amount was designated for recreational facilities for Guantanamo detainees. The Health Insurance Protects America - Can’t Repeal IT (HIPA-CRIT) Act, which would repeal a portion of the Patient Protection and Affordable Care Act. The End Government Reimbursement of Excessive Executive Disbursements (End GREED) Act, which would place limits on executive compensation at firms that receive federal assistance. The Preventing All Your Bucks from Aiding non-Citizens is Key (PAYBACK) Act, which would withhold US aid from any foreign country in an amount equal to 110% of US medical spending on unauthorized immigrants from that country. The Electricity Needs Rules and Oversight Now (ENRON) Act, which would outlaw certain types of energy market manipulation. The Stop Unfair Giveaways and Restrictions (SUGAR) Act, which would eliminate sugar price supports. Other popular words include CARE, FAIR, STOP, HELP, HOPE, DREAM, and PROTECT. Most acronyms in bill titles directly relate to the subject of the bill, like the Arsenic Prevention and Protection from Lead Exposure in Juice (APPLE Juice) Act. But some seem like complete non sequiturs. Perhaps the biggest puzzle is the Build America Bonds Extension for Rural and Urban Transportation and Highways Act (BABE RUTH) Act. There's no evidence that the sponsor, Rep. Laura Richardson (D-CA), is even a Yankees fan. This analysis looks at the use of acronyms in the names of bills introduced by the US Senate and House of Representatives. The raw source data comes from the GovTrack Bulk Data API, which has structured data on bills introduced since 1973. It was processed using a lot of regular expressions, SQL queries, Python scripts, and time. Want to play with the raw-ish data yourself? Download it here. What counts as an acronym? The acronym has no intrinsic meaning. An example of this would be USDA or FBI (if you still have your pedant hat on, you may also realize that these are technically initialisms, not acronyms, because they're pronounced letter by letter. You can take the hat off now!). The acronym refers to a pre-existing thing, like a government department, program, or previous bill. Examples of this would be the TRICARE Affirmation Act, the AIDS Awareness Act, and the America COMPETES Reauthorization Act. We want new coinages only. If a pre-existing acronym in a bill name is created from different words as a reference to the original, that would still be included. An example of this is the Instituting Responsible Spending (IRS) Act, which requires fees collected by the IRS to be deposited in the Treasury as general receipts. Members of Congress are unendingly creative with their acronyms. They vary the spelling (the SAAAVE Act), pick and choose which letters to take from constituent words (the Clear Law Enforcement for Criminal Alien Removal Act, or CLEAR), add punctuation (the POLAR-C Act), make hybrid acronym phrases (the COPS and KIDS Act), and just generally confound any ability to extract meaningful acronyms with 100% accuracy. You cannot discard known acronyms out of hand, because of bills that coin them anew, like the New Aid for Trustworthy, Affordable (NAFTA) Drugs Act, which concerns drug imports from Canada and Mexico. Although I try to exclude reauthorizations and amendments to old bills, there are still many duplicates, from the same bill getting reintroduced over and over. Sometimes a bill's acronym doesn't look like it has any meaning until you squint and really think about it, like an inscrutable vanity license plate. Some bill titles include random uppercase words that have nothing to do with the initials. It's not always clear whether an acronym is an intentional coinage; the fact that the result is word-like may be incidental. "What counts as an acronym?" sounds like a pretty simple question until you start exploring this data. The bottom line: this data is about as accurate as it can be, probably 98%, but keep in mind that it's not perfect. If you find any issues, let me know!